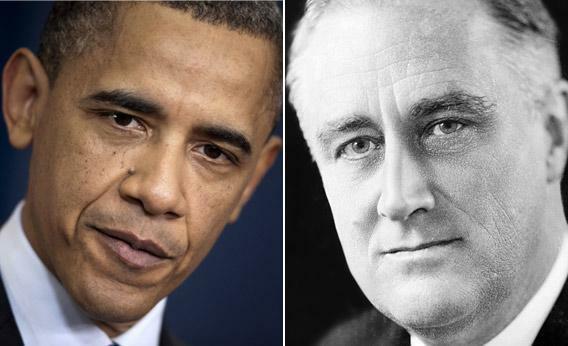 Barack Obama can fight political gridlock by following the example of Abraham Lincoln and FDR. By following in the footsteps of Lincoln and FDR. Should Obama follow the path of Abraham Lincoln and FDR and put some Republicans on his Cabinet? Photos by Brendan Smialowski/Getty Images and Elias Goldensky. In Steven Spielberg’s beautifully acted new movie, a controversial president, who is either loved or hated, has just been re-elected and faces a divided Congress in the midst of a national emergency. One of the standouts in Lincoln is a conscience-stricken Democratic congressman named George Yeaman. The Kentucky representative agonizes over whether to rise above partisanship and vote for the 13th Amendment. How Lincoln gets Democrats, and even some fellow Republicans, to do the right thing is the guts of the movie. Our problems today pale in significance to those faced by Abraham Lincoln. Nevertheless, President Obama faces a historic challenge in persuading an opposition party off its partisan ledge to avoid a national calamity; in this case, heading over a “fiscal cliff,” meaning a series of dramatic, automatic spending cuts that few people actually want and which would certainly stymie sensible government. Lincoln confronted the challenge in his day by making a moral and patriotic appeal and, when that did not work, by offering jobs—good, old-fashioned patronage. The fracturing of the Republican Party’s Reagan coalition offers President Obama a number of opportunities. As a number of GOP analysts have noted since the election—most notably Alex Castellanos—the party has to retool to match the changing demographics of the country. If there was any doubt, today’s column by Charles Krauthammer on the need to embrace amnesty for illegal immigrants suggests that that the GOP brand is in flux. The modern-day equivalents of the “interventionist” Republicans of the 1940s are members of the GOP who believe that government can be a force for good, but that it ought to be more efficient and effective. These are the Republicans who stood behind President George H.W. Bush and supported the budget compromise of 1990, which together with President Bill Clinton’s policies (and the collapse of the Soviet Union) created the economic boom and the budget surpluses of the 1990s. These “Good Government” Republicans don’t win elections much anymore—because they cannot survive GOP primaries—but they did not disappear from the face of the earth. Since our current emergency is economic, is it not the right moment for President Obama to create a bipartisan domestic war Cabinet? Secretary Timothy Geithner has wanted to leave the Treasury Department for some time. Were Obama to select a high-profile Republican who believes in a balanced approach to deficit reduction and recognizes (as did Mitt Romney in the second debate) that a free market needs some government regulation to work, the public would quickly tire of the bickering of House Republicans. The “no new taxes” purists would be marginalized. In addition, President Obama, who believes in lower corporate taxes and domestic job growth, would be helped by adding a Republican secretary of commerce, perhaps a businessperson. Who better to smooth over the restiveness among some small business owners, who will now have to live with Obamacare, than a Republican CEO? Obama has done this before. In 2009, he kept Robert Gates at the Defense Department. The choice was a stroke of political genius. Killing Bin Laden certainly sealed the transformation, but Obama’s reappointment of Gates complicated GOP efforts to criticize the president as they had previous Democratic presidents for being weak on defense. In the third debate, the effect of Obama’s nonpartisan management of foreign policy was very clear: The GOP challenger generally agreed with the Democratic incumbent on national security issues. Conditions are ripe for recruiting a bipartisan economic Cabinet. The combination of a hyper-partisan Congress and the Tea Party’s grass-roots efforts pushed a number of “Goo-Goo” Republicans out of office. Sens. Richard Lugar and Olympia Snowe, for example, are great Americans who would put country above party. Another potential recruit would be former Sen. Alan Simpson of Simpson-Bowles fame. None of these people are spring chickens, but they have gravitas and could be very effective over the course of the year or two it took to solve the immediate crisis. A younger choice, but one who is more conservative, would be the retiring Gov. Mitch Daniels of Indiana. Democrats are historically better at constructing bipartisan cabinets than Republicans. Besides FDR, Kennedy also gave big jobs to his erstwhile political opponents. He did not offer Richard Nixon a job, but he did give Nixon’s running mate, Henry Cabot Lodge II, a key embassy (South Vietnam). He also gave Eisenhower’s secretary of state, Christian Herter, the job as U.S. trade representative. His secretary of the treasury was a prominent Republican, C. Douglas Dillon. Remember, presidents are really the deciders, so choosing fallen Republicans does not mean denying the historic nature of Tuesday’s results. But there would be no better symbol of a real effort to seek a solution to a national crisis—and the failure of the Grand Bargain last year has set us up for one now—than to bring responsible members of the opposition into the government. Imagine how the politics of the moment would change if Obama declared war on the deficit and unemployment and then created a national, bipartisan team to fix it? Think of how this would complicate any efforts by recalcitrant House Republicans to try to cast the issue, once again, as American patriots vs. “socialist” Obama? Yes, in the end, there would be some compromises by the president. But since the American people reaffirmed GOP control of the House, the president could not run the table in any case. (Indeed he could not run it in 2009 when his party controlled both houses of Congress.) The issue now is how to make Washington governable again. In Lincoln, Yeaman’s ultimate decision rested on whether he believed the country had changed. In 1940, Stimson and Knox joined FDR’s government because they believed their party was out of step with a changing world situation. In 1980, Ronald Reagan’s victory symbolized the end of the Democratic Party’s ability to count on the New Deal coalition to win them the White House. Tuesday’s results confirmed that 2008 marked the end of the Reagan coalition of blue-collar workers, immigrants from European countries, white Southerners, and evangelicals as a pathway to the White House. The moment is right for the president to enlist Republicans who understand that their party must change, that Obama’s victories were not flukes, and who share the belief of most Americans that helping the country avoid the “fiscal cliff” is this era’s definition of patriotism under fire. In winning re-election after boldly embracing health care reform, Barack Obama is on track to achieving the rank of a “great” president. This could seal the deal.